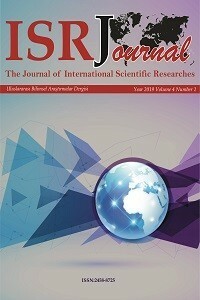 The aim of The Journal of International Scientific Researches (ISR) is to publish research articles on business and economics sciences, and other social sciences that are related to business and economics for contributing to the international social sciences literatüre. provides a forum for exploring issues in basicly Economics and Management but also welcomes the articles in various social science areas. (ISR) publishes high quality studies in the fields of business administration, economics, public finance, labor economics, econometrics, and business law. The aim of The Journal of International Scientific Researches (ISR) is to publish research articles on business and economics sciences, and other social sciences that are related to business and economics for contributing to the international social sciences literatüre. provides a forum for exploring issues in basicly Economics and Management but also welcomes the articles in various social science areas. (ISR) publishes high quality studies in the fields of business administration, economics, public finance, labor economics, econometrics, and business law. Although (ISR) has a preference for academic studies, it also welcomes studies that are written other researchers and practitioners. The goal of(ISR) is to constitute a qualified and continual platform for sharing studies of academicians, researchers and practitioners. The target group of (ISR) consists of academicians, researchers, professionals, students, related professional and academic bodies and institutions.